Compact Fluorescent Lamps (CFLs) last longer and need about 50 percent less energy than the traditional incandescent bulbs. They are popular among masses because of their eco-friendly label, however anyone who has examined the effects of CFL bulbs knows of the several health and environmental threats associated with them. A latest study puts light on only one such concern that is these ‘green’ CFL bulbs emits UVA radiation that are capable of damaging skin. Researchers have found that significant levels of UVC and UVA were emitted which was a result of cracks that existed in the coating on the bulbs. On studying the results of these emissions on human skin cells, researchers established that healthy skin cells suffered the similar damage that would occur with ultraviolet radiation. Despite offering large energy savings, consumers should carefully opt for CFL bulbs. In addition to having a possible negative effect on the skin, these bulbs emanate toxic chemicals. It was discovered that energy saving fluorescent bulbs emit poisonous carcinogenic chemicals into the air and a recent study has also found that these harmful chemicals are persistently released for over weeks to months. In addition to emitting the cancer-causing chemicals such as phenol, naphthalene, and styrene, which are far above the safe level approved by the Environmental Protection Agency (EPA), these bulbs also release excessive levels of mercury which are again far beyond the safe levels for humans. Ample of researches reveal that UVA radiation can enter into the deepest levels of skin tissue and add significantly to wrinkling of skin. According to a study UVA radiation results in utmost damage to skin cells which leads to skin cancers. These cells are known as keratinocytes and they are the same cells that researchers exposed to rays emitted from CFL bulbs. The German scientists have associated cautionary advice with these bulbs and have asked to keep these light bulbs as far away as possible from the human environment. However, if used it is advised to use them in moderation and in areas with good ventilation and undeniably not in the proximity of the head as the bulbs produce electrical smog that badly affects human health. The recent German study supports the finding that the light emitted by CFLs has aggravated the possibility of breast cancer in women by impairing the body's production of the hormone melatonin. The CFLs is well known for containing toxic mercury, a neurotoxin that can impair the brain, liver, kidneys and central nervous system. The bulbs are sold as “safe” till the time the glass remains unbroken. If the bulbs are cracked, broken or not disposed-off appropriately, they can cause the poisonous dust to spread into the air. A single fluorescent light bulb contains sufficient mercury to pollute 6,000 gallons of water and to disturb motor functioning, impair cognitive ability and emotional stability in humans. Furthermore, these CFLs emits radiation that has been associated with migraine headaches, sleep disorders, fatigue and other health defects whilst the flickering of fluorescent bulbs can cause giddiness, headaches, weakness and illness in some vulnerable people. CFLs produce light by heating gases in a glass tube and these lights contain a little amount of the heavy metal mercury. This chemical is so toxic that it can be dangerous even to touch. If these lights break, extreme cautiousness should be taken when cleaning up the pieces. Mercury outflows as a vapor that can be unsafe to breathe in and it also settles as a fine powder in the region where the bulb broke. One needs to aerate the room while making sure that no breeze carries the powder around. 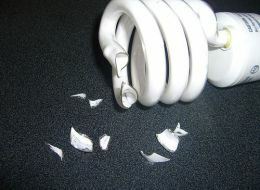 Clear out the broken bulb by picking up large pieces of the bulb with stiff paper or cardboard while wearing gloves. To remove powder settled on fabric, use duct tape to hoist the residue and the small fragments. Using a broom or a vacuum can spread the mercury in area, so it is advise not to us them. Instead wipe down surfaces with a moist paper towel or throwaway cloth. A sealed plastic bag or glass jar with a metal lid should be used to dispose everything. Due to mercury content, some states do not permit residents to dispose CFL bulbs into the garbage. However, the nearby facility that accepts these bulbs might be numerous miles away. Even though these bulbs are packaged properly for garbage disposal, they are likely to crack, freeing mercury into a dump. From the dump, mercury can percolate into soil and groundwater. Mercury leakage from CFL bulbs that break in the trash can negatively impact the health of garbage workers. The bulbs might shatter anywhere in the disposing course, from dumpsters to garbage trucks to the landfill itself. The vapors can spread and workers are exposed to dangerous levels of mercury. Another problem with compact fluorescent light bulbs is emission of ultraviolet light. According to research conducted by the Health Protection Agency in the United Kingdom, some of these lights emit ultraviolet radiation at levels that can harmfully affect people sitting in proximity of 1 foot from the light for more than one hour a day. Light-emitting diode (LED) bulbs are a much safer substitute to CFL bulbs. Those who wish to switch to something that uses less energy would do well to explore LED alternatives. Though they are usually more costly than the other technologies owing to inadequate acceptance in the majority, they are more environment friendly than CFLs and emit far less pollution. In the search of more energy efficient lighting alternatives, many people are opting new ways of lighting their homes. Therefore, LED bulbs have found application in many different home and commercial lighting. LED lights use much less energy than normal incandescent bulbs. Use of these bulbs can result in a considerable savings in energy costs, over the longer lifespan. According to the Department of Energy, lifespan of CFL bulbs is about 10 times longer than their incandescent equivalents, while LED bulbs can last even more than 15 times longer and some designs can serve up to 20 years or more. The lifespan of CFLs is also depend on usage since turning on and off the bulb frequently can increase its chance of failure. LEDs undergo no such reduction in lifespan and their robust construction keeps them working years longer than their alternatives. Compact fluorescent bulbs need a small warm-up period, producing an evident delay when turned on. On other hand, LED bulbs switch on instantly and produce a strong light. LED bulbs propose no concerns and are harmless for consumers and the environment.